Seller will give you a gift certificate in the amount of 16,98 RUB for a positive review of the product purchased. Kaspersky Anti-Virus - extension of the license for 2 PCs for a period of 1 year. Attention! For activation only on the territory of the Russian Federation. Attention! In case of a mismatch between the product being renewed and a previously purchased one or in the absence of an activation code for previously acquired software, the license will be limited to 8 months. Kaspersky Anti-Virus is a solution for basic computer protection against the main types of Internet threats. Anti-virus protection against malicious programs, high speed, convenient protection management. Anti-virus scanning of files, programs and websites, anti-phishing and protection from encryption software. 1150 MB free hard disk space. Processor with SSE2 instructions support. Internet connection to install and activate the program, use the Kaspersky Security Network, as well as update the databases and program modules. Microsoft Internet Explorer 8.0 or higher. We recommend using Microsoft Internet Explorer 9.0 or higher for working with the My Kaspersky portal. Microsoft Windows Installer 3.0 or higher. 1 GHz processor or higher. 1 GB of free RAM for a 32-bit operating system and 2 GB of free RAM for a 64-bit operating system. For Web Anti-Virus and IM Anti-Virus components to work, the Base Filtering Engine service must be enabled in the operating system. Microsoft Internet Explorer versions 8.0, 9.0, 10.0, 11.0. Internet Explorer versions 8.0 - 11.0 in the style of the new Windows interface is not supported. Mozilla Firefox versions 52.x - 59.x and higher. Google Chrome version 48.x - 64.x. 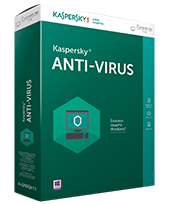 Kaspersky Anti-Virus supports Google Chrome and Mozilla Firefox in both 32-bit and 64-bit operating systems. Intel Celeron 1.66 GHz processor or higher. 1000 MB of free RAM. Intel Atom 1600 MHz processor or higher. 1024 MB of free RAM. The display is 10.1 inches with a resolution of 1024x600. Intel GMA 950 graphics chipset. Seller will give you a gift certificate in the amount of 16,98 RUB for a positive review of the product purchased..